Snow’s in the Forecast. Here Are Tips to Keep Kids Safe! With the season of snow fast approaching, the Kent County Road Commission (KCRC) wants to ensure that children playing outside stay safe when plow trucks are on the road. That is why KCRC drivers have produced a short video to remind families of the tips that will help kids “Play It Safe” throughout the winter. When clearing the road during or after a snow storm, a plow driver’s view can be limited. The plow truck is big and has blind spots, and snow flying onto the windshield also reduces visibility. The driver may not be able to see children standing or playing too close to the road. 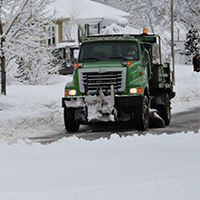 Plows can throw large chunks of ice and snow as they pass and the flying debris could hurt you. Never tunnel or build forts in the snowbanks along the side of the road. If you’re in the tunnel, you could be “snowed in” when a truck plows next to you. SAFETY PRINT OUT FOR THE FRIDGE!